The Food Alphabet and More: Shakey’s Unveils New Supercard Perks - Get it today!!! - Last Day Offer, Why you should get it today!!! This festive month of December, Shakey’s Guests have more reason to celebrate the holiday season with friends and family with the new Shakey’s Supercard SuperPerks Promo. Guests who avail a brand new SuperCard until December 31, 2015 will get a full Basket of Mojos added to their first transaction absolutely FREE. The Shakey’s SuperCard SuperPerks Promo is offered nationwide - available for dine-in, carry out, or delivery. Don’t waste any time! Visit a Shakey’s branch near you or call 77-777 and avail of the Shakey’s Supercard SuperPerks Promo and get that free entire Basket of Mojos added to your meal today. But wait! Here is why you should get a SuperCard today, coz It’s Back! Chicken N' Mojos Monday Madness is back! 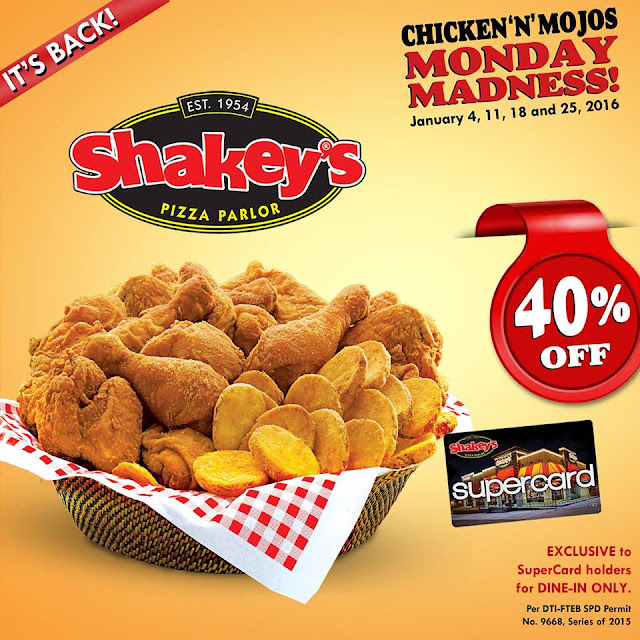 40% OFF on your well-loved Chicken ’N’ Mojos, exclusive only for Shakey’s SuperCard Holders. Catch it every Monday from January 4 to January 25, 2016. 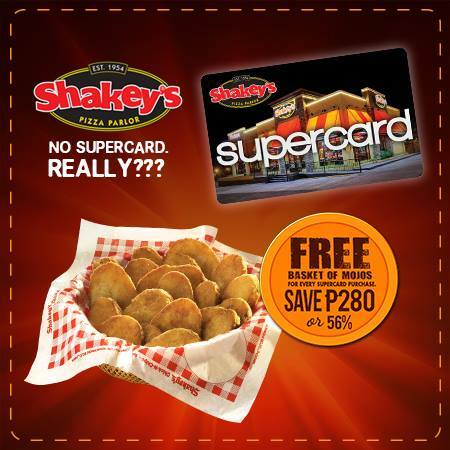 Now isn't that reason enough to get yourself the Shakey's SuperCard! Available in all stores nationwide, for DINE-IN only. For more information on the Shakey's SuperCard SuperPerks Promo, LIKE Shakey’s Pizza on Facebook and FOLLOW @shakeysph on Instagram.